Ireland's first rugby international at the new Aviva Stadium in Dublin will be against world champions South Africa on 6 November next year. 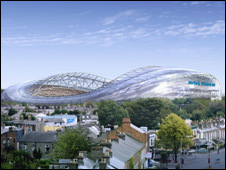 The building of the 50,000-capacity Aviva Stadium on the old Lansdowne Road site is scheduled to be completed by next April. Games against Samoa, New Zealand and Argentina are already scheduled for November 2010. The South Africa game has now been added to those November dates. The historical significance of the game will also see the relaxing of the international rugby tradition where the home team changes jersey if there is a colour clash. South Africa will wear alternative strip to allow the Irish players to don their traditional green jerseys. Three months earlier on 11 August, the first football international at the new stadium will take place when the Republic of Ireland face Argentina. However, the first official game at the new stadium will be with the oval ball a few days earlier with a likely combination of the four provinces providing the teams.